Foreign Jews Forbidden Entrance, 1808. The capital of Hungary. Of the several congregations within this tripartite city, Buda (Ofen), Ó-Buda (Alt-Ofen), and Pesth, that at Buda is the oldest (see Alt-Ofen); Jewish population in 1900 was 166,198. The first mention of the Jews of Pesth dates back to 1406, in which year Saul of Pesth and Saul of Ofen obtained from Béla IV. certain privileges which were countersigned by the chapter of Stuhlweissenburg, when they settled in the last-named city. In 1504, Jews owned houses and lands at Pesth. At the time of the Turkish rule their cemetery was situated in the present Leopoldstadt. After 1686, in which year the Turks were driven from Pesth, no Jews were allowed to live there for nearly a century; and the magistrate of Pesth collected a tax of thirty kreutzers from every Jew traveling through the city, and one thaler fromevery Jew remaining in it overnight—a right that Pesth claimed by virtue of the letter of privileges granted by King Leopold I. Oct. 23, 1703, according to which it was left in the hands of the municipal council to admit Jews or to refuse them admission. When the governor enrolled the Jews of Hungary in 1735, the city of Pesth decreed that neither a heretic nor a Jew could live or settle there in future; but they were allowed to visit the markets of the city from the sixth decade of the eighteenth century. In endeavoring to gain a permanent residence in the city, the Jews were always frustrated by the magistracy. The latter in 1762 even begged the prince primate, Count Franz Barkóczy, who had become the protector of the city, to exclude the Jews. This resistance of the city authorities was finally overcome by the emperor, Joseph II., after whose decree of March 31, 1783, Jews slowly began to settle at Pesth. The first arrivals came from Alt-Ofen and settled generally in the Theresienstadt, which at the present time (1902) is most thickly populated by Jews. The city of Pesth would not allow them to live elsewhere, and would have transformed the Theresienstadt into a ghetto, but failed to do so when Israel Abraham Offenheim, with the permission of the authorities, rented a house and a store in the inner city itself in 1786. Jews were allowed to live in the city only with the permission of the king, and those who bought this right for large sums were called "tolerated Jews"; those who were only temporarily received by the city were called "Commoranten" (sojourners). In 1787 fourteen tolerated Jews were living at Pesth; the settlement numbering 114, including servants. At first they were not allowed to have their own butcher-shop, the kosher meat being cut up twice a week by the municipal butcher. 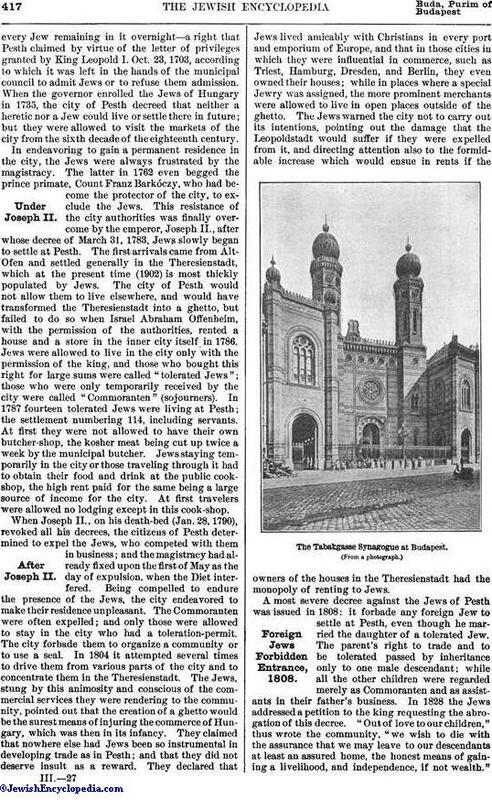 Jews staying temporarily in the city or those traveling through it had to obtain their food and drink at the public cookshop, the high rent paid for the same being a large source of income for the city. At first travelers were allowed no lodging except in this cook-shop. When Joseph II., on his death-bed (Jan. 28, 1790), revoked all his decrees, the citizens of Pesth determined to expel the Jews, who competed with them in business; and the magistracy had already fixed upon the first of May as the day of expulsion, when the Diet interfered. Being compelled to endure the presence of the Jews, the city endeavored to make their residence unpleasant. The Commoranten were often expelled; and only those were allowed to stay in the city who had a toleration-permit. The city forbade them to organize a community or to use a seal. In 1804 it attempted several times to drive them from various parts of the city and to concentrate them in the Theresienstadt. The Jews, stung by this animosity and conscious of the commercial services they were rendering to the community, pointed out that the creation of a ghetto would be the surest means of injuring the commerce of Hungary, which was then in its infancy. They claimed that nowhere else had Jews been so instrumental in developing trade as in Pesth; and that they did not deserve insult as a reward. They declared that Jews lived amicably with Christians in every port and emporium of Europe, and that in those cities in which they were influential in commerce, such as Triest, Hamburg, Dresden, and Berlin, they even owned their houses; while in places where a special Jewry was assigned, the more prominent merchants were allowed to live in open places outside of the ghetto. The Jews warned the city not to carry out its intentions, pointing out the damage that the Leopoldstadt would suffer if they were expelled from it, and directing attention also to the formidable increase which would ensue in rents if the owners of the houses in the Theresienstadt had the monopoly of renting to Jews. The Tabakgasse Synagogue at Budapest. (From a photograph. )Foreign Jews Forbidden Entrance, 1808. A most severe decree against the Jews of Pesth was issued in 1808: it forbade any foreign Jew to settle at Pesth, even though he married the daughter of a tolerated Jew. The parent's right to trade and to be tolerated passed by inheritance only to one male descendant; while all the other children were regarded merely as Commoranten and as assistants in their father's business. In 1828 the Jews, addressed a petition to the king requesting the abrogation of this decree. "Out of love to our children," thus wrote the community, "we wish to die with the assurance that we may leave to our descendants at least an assured home, the honest means of gaining a livelihood, and independence, if not wealth. "If the father died all the children who had been working with him as "assistants" had to emigrate, with the sole exception of the tolerated son. It happened often that the only available husbands for their daughters were shiftless and undesirable Jews, whose sole merit was that they possessed the right of toleration. Honest and industrious strangers were out of the question because they were forbidden to remain at Pesth or to engage in commerce. That all these endeavors to place difficulties in the way of Jews intending to settle at Pesth were futile may be seen by the fact that of 1,346 Jewish families living there in 1833, only 530 had the right of toleration or were Commoranten. The community of Pesth, increasing in numbers, wealth, and education, thus became from 1839 the foremost of the Hungarian-Jewish communities; working as such for the emancipation of Hungarian Judaism, and often convoking gatherings of representative Hungarian Jews for that purpose. It was due to the energetic interposition of the community of Pesth that King Ferdinand V. (1835-1848) abrogated the toleration-tax by which the Jews had been branded for a century. The Jews of Pesth sympathized with the nation at the time of the Hungarian struggles for liberty. Although the populace attacked and plundered the Jews on the second day of Passover, April, 1848, and the intolerance of the people excluded them from the national guard, the Jews were not long discouraged. The rabbi Schwab stirred up their patriotism, for which he was arrested after the uprising had been quelled. The Jews were so enthusiastic in the cause of Hungary that they even offered to sacrifice the silver paraphernalia of the temple and of the Ḥebrah Ḳaddishah; and all Jews entering the revolutionary army received their full equipment from the community. Haynau punished them for this patriotism with a heavy war-tax, part of which, however, King Francis Joseph I. remitted. Emperor Joseph sought to forbid the Jews to engage in retail business and in pedling, for which reason in 1788 he decreed that tolerated Jews should be received in Pesth only when they established a wholesale house or some manufacture. Within the community they were allowed to deal only in such goods as the Christian population lacked or in which they could not compete with Christian dealers. Only wholesale merchants were allowed to keep an open shop. Many Jews, therefore, who did not wish to engage in pedling, petitioned for the rights of a wholesale dealer, although they had neither the money nor the capacity for such business. Their profits were curtailed by visiting dealers, who came from near and far to the markets; there were heavy taxes and living expenses; and the shops had to be closed not only on the Jewish, but also on the Christian, holidays. Yet with all these drawbacks the Jewish business men of Pesth materially aided the development of the city. Noteworthy among the many eminent merchants is the Ullmann family, a member of which, the apostate Moritz, who was ennobled, was the first to propose the organization of the Commercial Bank of Pesth; he also originated the plans for the railroad from the Austrian frontier to Pesth and thence to Debreczen. Not only Jewish merchants, but artisans also settled at Pesth, among them the lace-maker Joel Berkovits, a descendant of Rabbi Heilmann of Metz, who had learned his trade with a relative, Ephraim Kossmann, at Berlin. Berkovits was also skilful in making Turkish fancy boxes. Although the gilds largely interfered with the development of Jewish industry, the Jewish community of Pesth encouraged many young men to learn trades. It instituted a fund to aid Jewish youths who followed laborious handicrafts, and with the assistance of Jacob Kern it was instrumental in founding in 1842 the Hungarian Israelitish Trades and Economic Association, which had benefited many Jews. Thus in due time the Jews contributed to the industrial development of the city, as well as to its culture, through the many teachers and university professors, judges, physicians, lawyers, and engineers they furnished to the community. Immediately after their settlement the Jews organized a place of worship in the Hausler homestead in the Königsgasse, paying a rent of 200 gulden for their synagogue. The necessary Torah-rolls were lent to them by the community at Alt-Ofen. On Aug. 17, 1787, the government gave them a permit to continue worshiping quietly in private houses of prayer without a rabbi. In 1796 they rented a room for a new synagogue in the house owned by Baron Orczy, an immense building that is still called the "Judenhof." 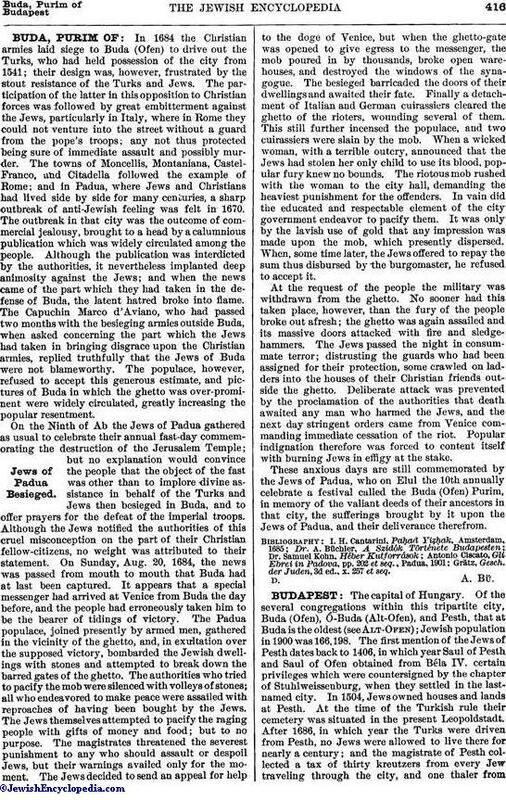 In the year 1800 there were, in addition to the Orczy temple (called the "large temple"), a Polish temple, and a separate house of prayer belonging to the Sephardim. The first place to adopt an improved (moderate Reform) manner of worship was the temple of the Ḥesed Ne'urim association, in the house of the "White Goose" ("Fehér Lud"). It was considered merely as a private synagogue; but when all private and association temples were dissolved in 1830, the community included this temple among its institutions, and transferred it also to the Orczy house, adjoining the "large temple." The communal temple was transferred in 1859 to the present magnificent building in the Tabaksgasse. 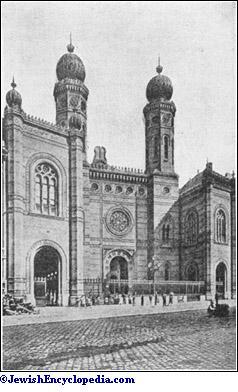 In the seventies a synagogue was organized for the Conservatives in the Rombachgasse, while their temple in the Orczy house was rented by the Orthodox congregation, which still worships there (1902). The temple of the Reform Society was from 1848 to 1852 in the Valero house in the Königsgasse. The Jews of Pesth at first buried their dead in Alt-Ofen. The city in 1788 assigned to them a free cemetery, which was situated on the plot now occupied by the Westbahnhof. A new cemetery was given to them in 1808 behind the city dike, in the Weitznerstrasse, and they transferred thither in 1839 their dead and their tombstones. Gravestones with sculptured images of men and women were erected in this cemetery as early as 1832, a practise against which Moses Sofer, rabbi of Presburg, vigorously protested. As this cemetery proved to be too small, a new one was assigned to them near the Kerepeserstrasse. Lately the community bought forburial purposes a large plot of ground behind Köbanya. The Ḥebrah Ḳaddishah was founded in 1790. It is one of the largest benevolent societies, its budget for 1902 being 511,671 crowns. In 1800 Israel Wahrmann founded the Shi'yur society. The hospital was organized in 1805. There are also the following associations: Ḥesed Ne'urim, Biḳḳur Ḥolim, Menaḥem Abelim, and Tomke Yetomim; the Women's Society, founded in 1866, which owes its success largely to the noble Johanna Bischitz de Heves; the People's Kitchen, the hospital, the Adela Brody Children's Hospital, named after its founder; an orphan asylum for girls, and one for boys, which was founded by a philanthropist named Fochs: the new building of the last-named, inaugurated in 1901, is a monument to the labors of Jacob Deutsch. Many Jews have perpetuated their names by large foundations, among them Wolf Holitscher, Solomon Taub, Alexander Wahrmann, Philip Kunewalder, and Moses Ehrlich. The Jews of Pesth have always been public-spirited and philanthropic. During the cholera epidemic of 1831 they not only relieved Jews, but also furnished daily rations to eighty-two Christian families, earning the gratitude of the count palatine Joseph. They are, in addition, liberal contributors to the general philanthropic institutions of the country. The religious life of the community was at first under the supervision of the rabbinical council of Alt-Ofen, and, beginning with 1789, under Moses Münz, rabbi of that city. When Rabbi Wolf Boskovitz settled at Pesth in 1793, the community elected him rabbi. The government, however, deprived him of his office Dec. 27, 1796, in consequence of the intrigues of Moses Münz, and ordered the community to elect any one it chose to conduct its religious affairs, with the exception of Münz. In the spring of 1799 it elected Israel ben Solomon Wahrmann, rabbi at Bodrogh-Keresztur, against whom Münz again began to plot. In the following year the government ended these intrigues, and the enlightened Wahrmann was able peacefully to conduct the affairs of the community. He died June 24, 1826 at the age of seventy. His dayyanim were Simon, Oppenheimer, Azriel Brill, and Moses Kunitzer. 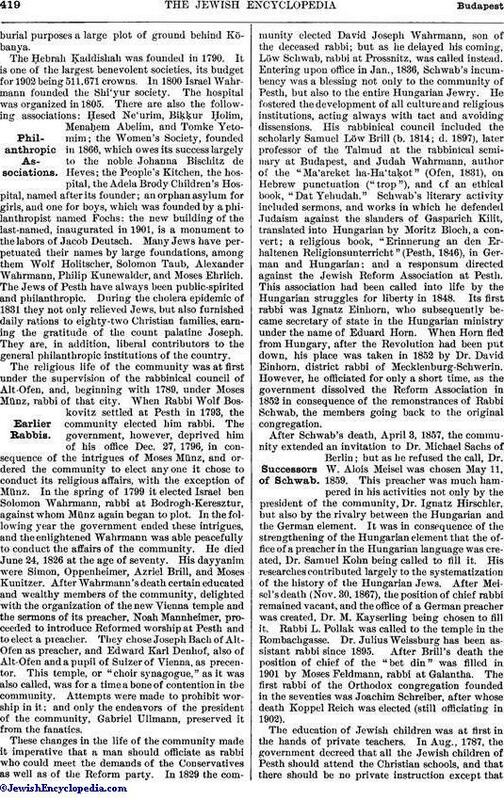 After Wahrmann's death certain educated and wealthy members of the community, delighted with the organization of the new Vienna temple and the sermons of its preacher, Noah Mannheimer, proceeded to introduce Reformed worship at Pesth and to elect a preacher. They chose Joseph Bach of Alt-Ofen as preacher, and Edward Karl Denhof, also of Alt-Ofen and a pupil of Sulzer of Vienna, as precentor. This temple, or "choir synagogue," as it was also called, was for a time a bone of contention in the community. Attempts were made to prohibit worship in it; and only the endeavors of the president of the community, Gabriel Ullmann, preserved it from the fanatics. These changes in the life of the community made it imperative that a man should officiate as rabbi who could meet the demands of the Conservatives as well as of the Reform party. In 1829 the community elected David Joseph Wahrmann, son of the deceased rabbi; but as he delayed his coming, Löw Schwab, rabbi at Prossnitz, was called instead. 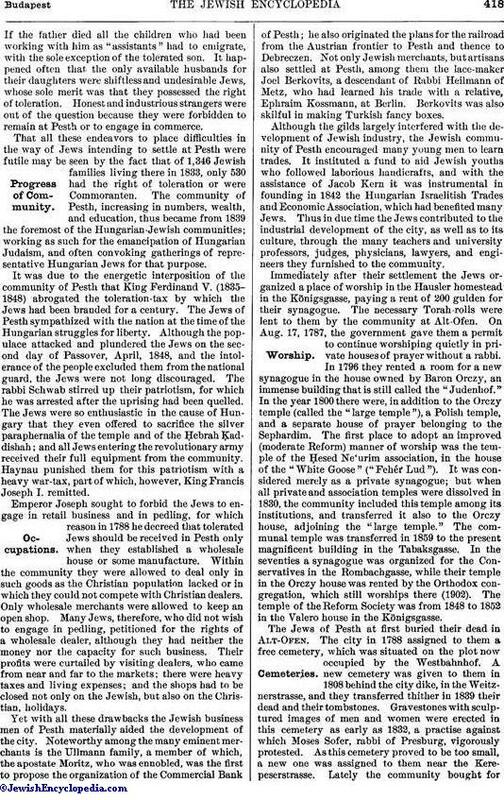 Entering upon office in Jan., 1836, Schwab's incumbency was a blessing not only to the community of Pesth, but also to the entire Hungarian Jewry. He fostered the development of all culture and religious institutions, acting always with tact and avoiding dissensions. His rabbinical council included the scholarly Samuel Löw Brill (b. 1814; d. 1897), later professor of the Talmud at the rabbinical seminary at Budapest, and Judah Wahrmann, author of the "Ma'areket ha-Ha'taḳot" (Ofen, 1831), on Hebrew punctuation ("trop"), and of an ethical book, "Dat Yehudah." Schwab's literary activity included sermons, and works in which he defended Judaism against the slanders of Gasparich Kilit, translated into Hungarian by Moritz Bloch, a convert; a religious book, "Erinnerung an den Erhaltenen Religionsunterricht" (Pesth, 1846), in German and Hungarian; and a responsum directed against the Jewish Reform Association at Pesth. This association had been called into life by the Hungarian struggles for liberty in 1848. Its first rabbi was Ignatz Einhorn, who subsequently became secretary of state in the Hungarian ministry under the name of Eduard Horn. When Horn fled from Hungary, after the Revolution had been put down, his place was taken in 1852 by Dr. David Einhorn, district rabbi of Mecklenburg-Schwerin. However, he officiated for only a short time, as the government dissolved the Reform Association in 1852 in consequence of the remonstrances of Rabbi Schwab, the members going back to the original congregation. After Schwab's death, April 3, 1857, the community extended an invitation to Dr. Michael Sachs of Berlin; but as he refused the call, Dr. W. Alois Meisel was chosen May 11, 1859. This preacher was much hampered in his activities not only by the president of the community, Dr. Ignatz Hirschler, but also by the rivalry between the Hungarian and the German element. It was in consequence of the strengthening of the Hungarian element that the office of a preacher in the Hungarian language was created, Dr. Samuel Kohn being called to fill it. His researches contributed largely to the systematization of the history of the Hungarian Jews. After Meisel's death (Nov. 30, 1867), the position of chief rabbi remained vacant, and the office of a German preacher was created, Dr. M. Kayserling being chosen to fill it. Rabbi L. Pollak was called to the temple in the Rombachgasse. Dr. Julius Weissburg has been assistant rabbi since 1895. After Brill's death the position of chief of the "bet din" was filled in 1901 by Moses Feldmann, rabbi at Galantha. The first rabbi of the Orthodox congregation founded in the seventies was Joachim Schreiber, after whose death Koppel Reich was elected (still officiating in 1902). The education of Jewish children was at first in the hands of private teachers. In Aug., 1787, the government decreed that all the Jewish children of Pesth should attend the Christian schools, and that there should be no private instruction except thatof one religious teacher. 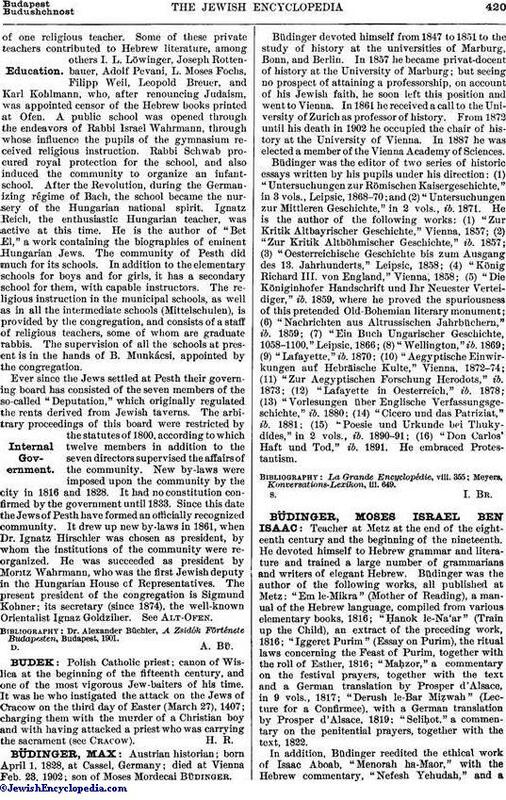 Some of these private teachers contributed to Hebrew literature, among others I. L. Löwinger, Joseph Rottenbauer, Adolf Pevani, L. Moses Fochs, Filipp Weil, Leopold Breuer, and Karl Kohlmann, who, after renouncing Judaism, was appointed censor of the Hebrew books printed at Ofen. A public school was opened through the endeavors of Rabbi Israel Wahrmann, through whose influence the pupils of the gymnasium received religious instruction. Rabbi Schwab procured royal protection for the school, and also induced the community to organize an infant-school. After the Revolution, during the Germanizing régime of Bach, the school became the nursery of the Hungarian national spirit. Ignatz Reich, the enthusiastic Hungarian teacher, was active at this time. He is the author of "Bet El," a work containing the biographies of eminent Hungarian Jews. The community of Pesth did much for its schools. In addition to the elementary schools for boys and for girls, it has a secondary school for them, with capable instructors. The religious instruction in the municipal schools, as well as in all the intermediate schools (Mittelschulen), is provided by the congregation, and consists of a staff of religious teachers, some of whom are graduate rabbis. The supervision of all the schools at present is in the hands of B. Munkácsi, appointed by the congregation. Ever since the Jews settled at Pesth their governing board has consisted of the seven members of the so-called "Deputation," which originally regulated the rents derived from Jewish taverns. The arbitrary proceedings of this board were restricted by the statutes of 1800, according to which twelve members in addition to the seven directors supervised the affairs of the community. New by-laws were imposed upon the community by the city in 1816 and 1828. It had no constitution confirmed by the government until 1833. Since this date the Jews of Pesth have formed an officially recognized community. It drew up new by-laws in 1861, when Dr. Ignatz Hirschler was chosen as president, by whom the institutions of the community were reorganized. He was succeeded as president by Moritz Wahrmann, who was the first Jewish deputy in the Hungarian House of Representatives. The present president of the congregation is Sigmund Kohner; its secretary (since 1874), the well-known Orientalist Ignaz Goldziher. See Alt-Ofen. Dr. Alexander Büchler, A Zsidók Förténete Budapesten, Budapest, 1901.